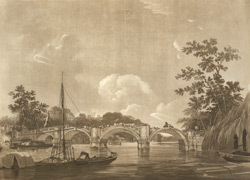 View of Richmond Bridge being constructed. Built with Portland stone in 1774-7, to a design of James Paine and Kenton Couse, it has an elegant five arch span. Widened in 1937, it is the oldest surviving Thames crossing.